Updated every 5 minutes with the latest real estate for sale in North Myrtle Beach - including MLS listings, homes, condos, townhomes, investment property, and land - as posted by North Myrtle Beach real estate agents and brokers - over 30% more listings than Zillow, Realtor, Trulia, and Redfin. Get Signed Up Now and get the latest North Myrtle Beach tax and HUD foreclosures, REO properties, bank owned homes, and short sales being offered at HUGE price reductions and significantly lower than retail value. North Myrtle Beach is a well-known coast city on the east coast of the United States in South Carolina. It resides in Horry County, and is situated on a large and continuous stretch of beach known as the Grand Strand. North Myrtle Beach is a tourist hub that was created in 1968 from four existing municipalities north of Myrtle Beach. It now serves as one of the primary tourist towns along the Grand Strand. It is divided into four separate areas based on the aforementioned municipalities: Windy Hill, Crescent Beach, Ocean Drive, and Cherry Grove. Some notable people who are from North Myrtle Beach include: Alyssa Arce, Lou Saban, Kelly Tilghman, and Vanna White. Though it serves as a tourist hub, this area serves as a fantastic area for potential residents just as much as it does tourists and visitors. The North Myrtle Beach area, as well as its surrounding communities, cities and neighborhoods, all fall under a humid subtropical climate categorization. The summer seasons tend to be on the longer side, and especially hot and humid, with average daytime highs being from eighty-three to ninety-one degrees Fahrenheit. The coastal location of most of these areas somewhat mitigates the heat in comparison with inland areas of South Carolina. Mild winters are also expected, with rare freezing temperatures and light frost, thought it estimated less than fifteen days per year will see any kind of frost. Tropical thunderstorms and precipitation are common during the summer months as well. North Myrtle Beach is one of the best areas you can find on the East Coast to get out and enjoy some beach culture and aquatic fun. Even if you prefer the land, North Myrtle Beach has plenty in the way of local landmarks, tours, activities and all sorts of recreation for you and the whole family to enjoy. North Myrtle Beach is a city that is made for tourists, and it has no shortage of shopping outlets to let you souvenir shop in style. No matter what you are looking for, or what kind of retail therapy you need, North Myrtle Beach is one of the best cities you can find yourself in, no matter what kind of shopper you are. North Myrtle Beach has a fantastic mix of exotic cuisines coming together to form one phenomenal dining experience. With its waterfront views, seafood and exotic cuisines from all over the world coming together on your plate, you can hardly find a better experience. Dining in style is the standard in North Myrtle Beach and it doesn’t get much better than that. North Myrtle Beach is a coastal city, and no one parties quite like beach bums. Of course, if you aren’t up for an Oceanside barbeque after dark, North Myrtle Beach has plenty in the way of bars, pubs, clubs, lounges and breweries to let you spend the night out in style. Whether you want to dance the night away or catch a cold one while looking out over the water, North Myrtle Beach is the place for you. 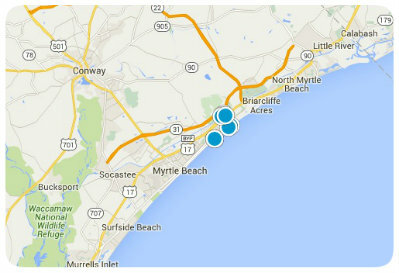 The North Myrtle Beach area is highly praised for its school systems throughout its many suburbs. Those looking to raise a family, or to further their own education, need not worry about a shortage of schools, both conventional and unconventional; it’s the perfect opportunity to learn on the beach, and off it. For those who are looking to make the move to any area within the North Myrtle Beach area, the local job market is not in short supply, nor is the income many residents can expect. There are a feature of many big names and hubs, as well as smaller boutiques, shops and restaurants that can make use of all kinds of varying talent residents might have to offer. If you want to step out of the water for a bit and enjoy some local history or culture, the North Myrtle Beach area is in the perfect place to do so. Not only do you have an abundance of rich history, but you also have several historical towns about and the ever present presence of the beach culture around. North Myrtle Beach has built its reputation as a coastal tourist attraction that one shouldn’t miss – and that fact is true. Both potential residents and visitors can enjoy the scenic views, plentiful activities and all around beauty of this coastal city. Be the first to know when new North Myrtle Beach short sales, foreclosures, deeply discounted homes, and brand new hot properties come onto the market before anyone else - over 30% more listings than Trulia, Zillow and Realtor. Do you own a home in North Myrtle Beach and want to find out instantly and completely free what it is worth in today's market - with absolutely no cost or obligation?